January | 2016 | What Next? Some create an almost perfect pattern. It reminds me of how varied the path through life can be for different people. What kind of design will my life’s path leave? We decided to take the public bus into the city of Santa Cruz yesterday. Our trip was a bargain. We got a ninety minute ride for just about $2 USD. The bus was nice and clean although on the way home it was so full we had to stand most of the way. Our drive to Santa Cruz was a good chance to view the scenery of Costa Rica and also to pass through some interesting towns. Dave noticed that every community no matter how small had a soccer pitch with lights. The highway was nicely paved and there was even a separate paved pathway for bikes along some of it. My brother who has traveled a fair bit in Central America couldn’t believe how clean Santa Cruz was compared to cities in Mexico or Guatemala. Santa Cruz had almost no litter or garbage. There were nice sidewalks everywhere and paved streets and traffic moved in an orderly fashion. A friendly police presence was evident. Houses were clean and painted and there were many modern businesses. We went into a pharmacy to buy some toiletries and sunscreen which were selling for cheaper prices than in Tamarindo, the town on the ocean where we are staying. If we hadn’t had a ninety minute ride home in a unairconditioned bus ahead of us we definitely would have bought some meat and cheese at this local stand which featured prices that were less than half of what we pay in Tamarindo. There are these litter disposal units all over Santa Cruz where you can deposit different kinds of garbage in different containers for recycling. No wonder the city was so clean! In a small bakery we saw this poster featuring all the unique kinds of houses in Santa Cruz today that were built in different decades. The main church in Santa Cruz was destroyed in an earthquake in 1950 and this clock tower is all that remains. We went inside the new church built to take the place of the one that was destroyed. We spent quite a bit of time in a park in the center of town. While Dave relaxed and Ken looked for a place for us to eat in his Lonely Planet guide-book I went all around the park photographing the various statues to help me learn more about the history of Costa Rica. I will blog about that in a future post. We found a bright clean little restaurant where we had….. an arroz con pollo dish complete with rice, beans, chicken, salad and fried plantains. We decided to have smoothies for dessert and went to this stand where the woman cut up a blender full of fresh fruit for each smoothie before mixing it with ice cubes and a little milk. I had mango and banana and it was fantastic! 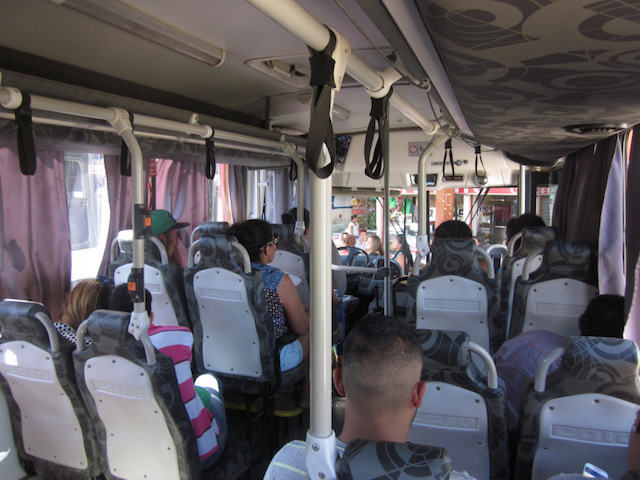 Then we said farewell to Santa Cruz and made our way to the municipal bus station to catch our ride back to Tamarindo. It was nice to see how ordinary Costa Ricans go about their daily lives in Santa Cruz. We only saw a handful of other North American tourists during our visit. Perhaps one reason there is money for the infrastructure that makes Costa Rica’s cities clean, sanitary and safe is because the country has had no army since 1948. Money that would have been spent on the military has been put into health care, education and environmental protection. That’s also probably why there is such a high literacy rate in Costa Rica and life expectancy is the same as in North America. On Tuesday we left our lovely little Casa in Playa Grande and moved to our new casa in Tamarindo. On Wednesday morning my brother Ken and I set off on our first walk in our new location. We have gone for an early morning walk every day in Costa Rica. This time we decided to ‘head for the hills’ behind our place on the outskirts of town. The moon was still visible as we walked through the forest. Suddenly we heard this loud noise. I wondered if it was a jaguar. Ken wondered if it was a wild pig. Then we spotted a gang of howler monkeys up in the trees. They were making the noise! We were stopped a couple more times along the way by more howler monkey choirs. Click on the photo above if you want to hear the howler monkey sounds I recorded. The town of Tamarindo is a bustling, touristy community so it was nice on our walk to see some solitary, quiet local farms. After we walked past the farms we came upon a surfer camp in the middle of the trees. There were tents pitched there that resembled gigantic canvas yurts. This psychedlic bus on the yard looked liked something straight out of the 60s. We guessed someone must be living in it now because it didn’t look like it would be able to drive anywhere. The road we were following suddenly began to incline sharply and we realized we were now truly heading up into the hills. It was a much steeper climb than we’d thought and we were pretty exhausted by the time we reached the top of the highest hill. But the view down into the valley below made the climb totally worth it. From the top of the hill we could see the three beaches we had hiked last Sunday far in the distance. Then we began our steep walk down to the ocean. It was pretty treacherous. Lots of loose gravel and sand. We had to walk slowly and carefully not to slide down. This Mom on a quad was taking her daughter downhill from one of the farms near the top to meet the school bus at the bottom of the hill. At the bottom of the hill we found ourselves in a barrio where some of the working class people of Tamarindo live. In sharp contrast just minutes later we passed the entrance to Casa Bali an 18,000 sq. foot luxury villa with eight bedrooms and several pools available for rent to discerning clients. The house comes complete with a personal chef, chauffer and concierge. As we walked through Tamarindo we saw the beautiful Iglesia de Santa Maria, a Catholic church. We went inside and I stopped to say a prayer for my family before we continued on our way. We arrived back at our casa two and a half hours after we left. Our morning walks so far in Costa Rica have been about one hour so this was an abnormally long expedition but an interesting and very enjoyable one. On our flight to Costa Rica we had a layover in the airport in Atlanta for several hours but the time went by quickly as I enjoyed the art on exhibit in every area of the Hartsfield-Jackson terminal. The purpose of the work displayed is not only to entertain passengers but also to introduce them to the city of Atlanta and the state of Georgia even if they never leave the airport. Here are some of the pieces I saw. Corncorde is by artist Craig Nutt. The form was inspired by the jet liners at the airport but the artist said he used a corn cob because corn is such a staple food in the American south and indigenous people were growing it before the arrival of Christopher Columbus. Craig Nutt says two of his favorite traditional southern dishes are cornbread and hominy grits. In RE: E28 artist Jo Walters has created birds, fish and mammals that are native to the forests, mountains and coastal waters of Georgia. Joni Mabe’s installation is called Southern Icons. It features famous people born in Georgia like baseball players Ty Cobb and Jackie Robinson, civil rights leader Martin Luther King, singer Otis Redding and author Mary Flannery O’Connor. Out of Many One by Sammie Nicely is a collection of masks made of clay and found objects that remind viewers of the African heritage of many of Georgia’s residents. This etching of downtown Atlanta by artist Michael Ehlbeck is called Sunday- May 12, 1996- 4:23 p.m. In Kudze Frieze by Dana Cibulski the top panel alludes to the location of the artwork in the airport, the soaring, swirling birds are a symbol of aeronautics. The kudze plant shown in the lower panel was introduced to Georgia from Japan and has run amok devouring forests and creeping onto highways. Because it has spread everywhere it has become a sort of unofficial state symbol even though it is thought of as a menace. This piece by Hoang Van Bui is shaped like the state of Georgia. It is called Common Dance and the bamboo plants at one end, are a recognition of the many immigrant families from Asia, including the artist’s, who are an important part of Georgia society. The empty space in the sculpture is a symbol of how many immigrants feel when the first arrive and are still homesick in their new surroundings. I saw many other art displays in the airport- one by children from Atlanta schools, a puppetry exhibition, and a ceramics show by local artisans and that was only in our wing of the airport. There is enough artwork in the Atlanta airport to fill a traditional gallery and it is all on view free of charge for passengers. Last Sunday we went for a 6.5 mile beach hike. The beaches in this part of Costa Rica are quite secluded and all along our way we met only a few Costa Rican families out for an afternoon by the ocean. Hiking was hard work, especially on the return trip walking on wet sand that slanted towards the sea. I was getting blisters from my sandals so I just took them off. It was 91 degrees but there was a nice breeze that made the walk more pleasant. I sang songs, recited poetry and counted the steps between the beach’s 1/4 kilometre markers. Eventually I decided to distract myself from the length of the trek back home by taking photos of things of beauty that captured my eye on the walk. Here they are! Half way through our stay at our picturesque apartment at Casa Chameleon in Playa Grande. Time for a clean up day. and shook out the hammock on the porch. I felt entitled to stretch out in the hammock with a glass of Sangria and my book after all that housework was done! We love our little casa here in Playa Grande and will miss it when we move to Tamarindo.